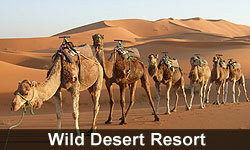 About Rajasthan welcomes you to the most romantic city of the state. Tenderly named as the Venice of the East, this city of lakes boasts of its rich Rajput architecture and heritage. Udaipur is located in the southern region of Rajasthan. With About Rajasthan, experience the fascinating city of Udaipur - Rajasthan and its magic. There are uncountable tourist attractions in Udaipur that will surely enrapture you. On your travel tour to Udaipur, do not miss to visit the City Palace. Built in 1725, the City Palace of Udaipur displays a magnificent architecture. A part of the City Palace of Udaipur has converted into a heritage hotel and rest is a museum that narrates the history of Udaipur. Erected by Maharana Singh in 1651, Jagdish Temple is the largest temple in this city of lakes. Encircled by rolling hills, palaces and temples,Pichola Lake is a splendid lake that envelops charm and pomp of bygone era. Other worth visiting places on your Udaipur tour is Saheliyon-Ki-Bari, Bharatiya Lok Kala Mandir, Gulab Bagh, Sajjan Garh, Fateh Sagar, Ahar, the Suraj Gokhada and Pratap Memorial. The various lakes in the Udaipur city have made it the Venice of the East. The pleasant climate of the city offers a welcome respite from the harsh climate of Rajasthan. From lakes in midst of the sandy terrain to green forested hills, the city offers many surprises that will leave you mesmerized. Its narrow and colorful streets make it a place worth more than a brief visit. The city also offers a variety of handcrafted items including dainty folk toys, brightly colored garments, hand-printed textiles, batiks, and tie & dye sarees and fabrics. This former summer residence of the royal family has now been converted into a fabulous hotel. The Mewar Festival is celebrated to welcome the advent of spring. 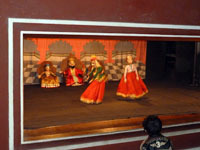 It coincides with the festival of Gangaur in Udaipur and has a unique charm about it. It is time for cultural events where Rajasthani culture is portrayed through songs, dances and other programmes. The festival culminates with an impressive fireworks display. City Palace, the majestic white royal building towers itself on a hill and is surrounded by crenellated walls. The palace was completed in its present form by the contribution of many rulers. Originally started by Udai Singh, the later additions were so carefully planned and integrated with the original building that it becomes difficult to believe that the building was not conceived as a whole. The city palace stands along the shores of Lake Pichola. The main part of the City palace, Udaipur is now preserved as a museum with a large and varied collection. It was established in 1890 AD and is one of the earliest museums of the state. Few gardens in India are as bewitching as this rose garden. Having roses from all over the world, in all fathomable hues and colours, this garden is a virtual feast to the enthusiastic as well as the weary souls. The panoramic lake that enraptured Maharaja Udai Singh, Lake Pichola is surrounded by hills, palaces, temples, bathing ghats and has two island palaces- Jag Niwas and Jag Mandir. It was later enlarged by the founder. Saheliyon-ki-Bari or the 'Garden of the Maids of Honour', so called because the royal ladies came here for a stroll, is a well laid out garden, with extensive lawns and shady walks. 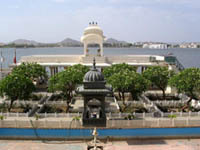 Shilpgram is located near Fateh Sagar Lake, 6 kms from the City Palace, Udaipur. It gives a glimpse of the tribal life of Rajasthan. Eklingji (22Km.) Eklingji, the city dotted with temples, is located about twelve miles to the North of Udaipur in Rajasthan. 22 kms from Udaipur, Eklingji is a complex of 108 ancient temples, incised out of sandstone and marble. Shilpgarm Festival - The 10 day festival is a treat for the visitor to an array of exquisite art and craft. Shilpgram hosts the festival. The City of Lakes is well connected by air services. The Dabok Airport is 21 kms from the city centre. Railway has trains from all over the country to destination Udaipur. The Palace On Wheels covers this magnificent city during its eight day package tour. There are bus services from tourist places in Rajasthan , Gujarat and Delhi. 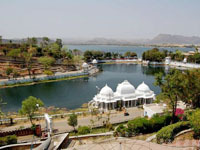 The lakes surrounding Udaipur regulates the climate, which is pleasant than in any other city in Rajasthan. The summers are hot and winters are cold but the temperature does not rise to extremes. The rainfall is less, around 61 cms annually.